We have prepared a crude chart, without fancy statistics or graphs, to give you an idea of what the monetary cost savingsmay be. The prices for the jarred food are for Stage 1, single ingredient foods. 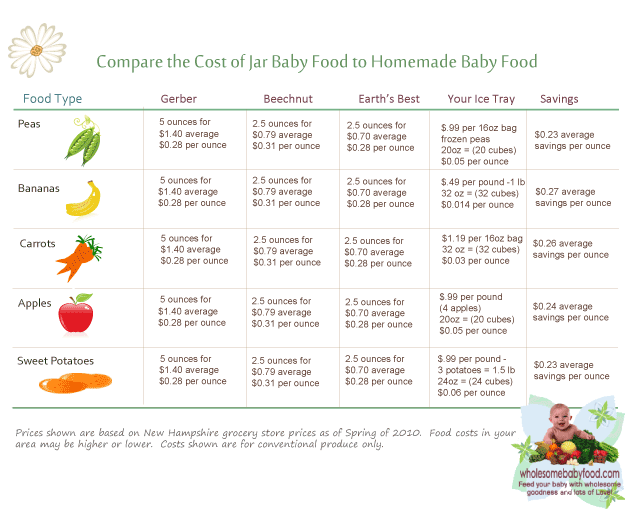 The prices for the produce below are reflective of the Southern New England – USA market; non-Organic produce. Prices vary and your savings may vary from a just a few pennies to $.10 or more. TIP: Buy a jar of “adult” 100% Natural Applesauce and save even more!